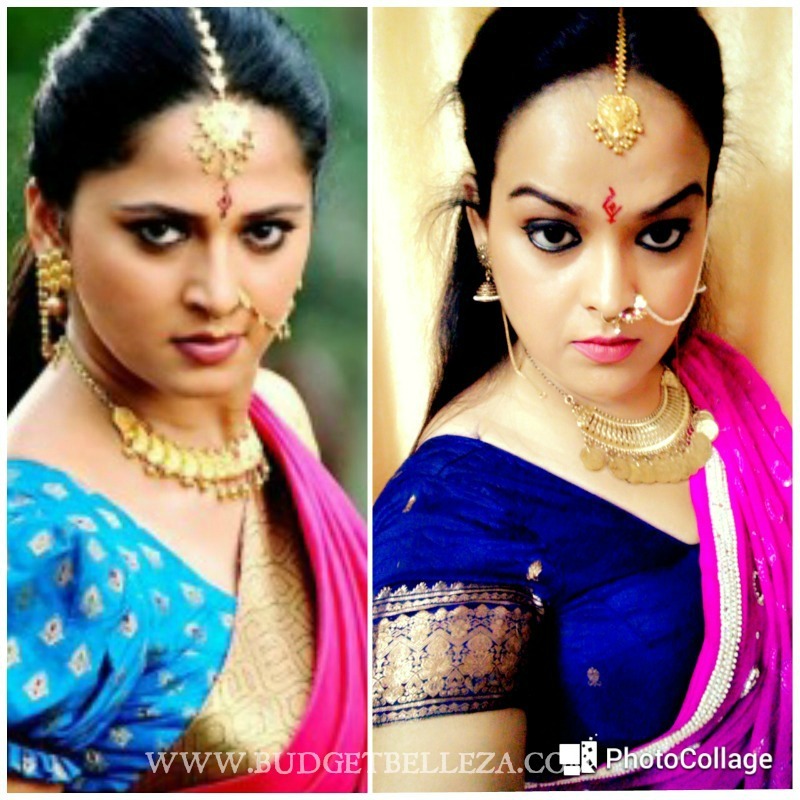 Devasena (Anushka Shetty) is a princess from Kunthala region, a small but prosperous region in the fictional universe of Mahishmati. She is accomplished, a great warrior and archer who is constantly trying to better her art through diligent practice. 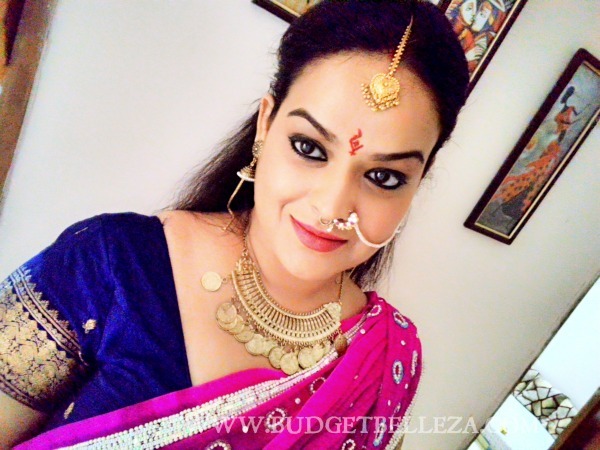 Bahubali seems to be impressed more by her technique of martial arts than her beauty — he doesn’t just think of her as a beautiful person, but as someone much more than. Given my obsession to our culture and the rave that Bahubali 2 is creating, I thought why not make the most of it and Recreate my version of Devasena. Since Devasena is a princess, the look is a super glam one with heavily kohled eyes and bright attire. Gold jewellery is a characteristic feature of South India and Devasena being a royal couldn't be left behind. To start off I searched my wardrobe for similar coloured saree and blouse of a matching hue (though it did not match :P) I found this bright hot pink saree with pearl embroidery that I wore for my engagement and the blue kanjivaram blouse is probably the only blue blouse I have! 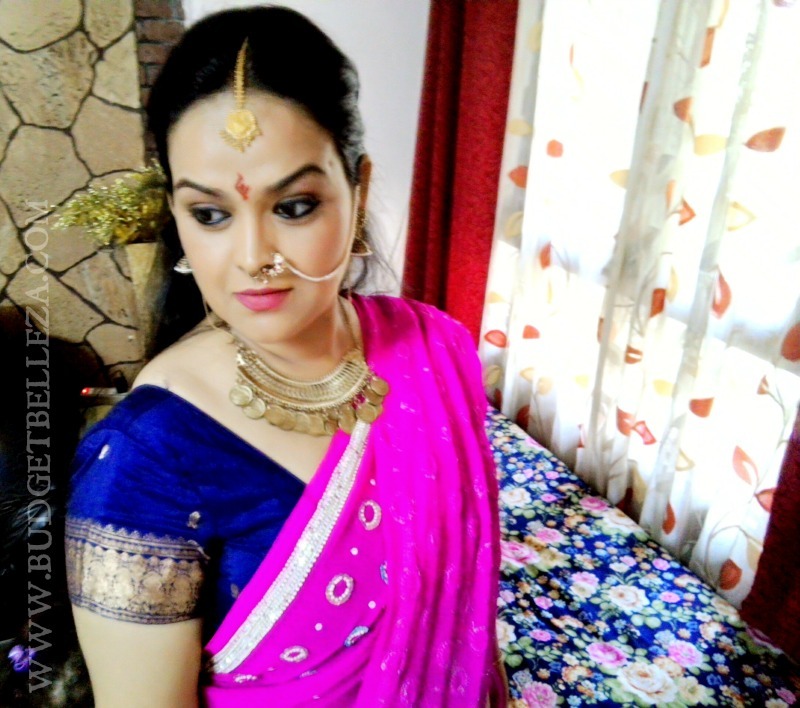 The second major concern was the jewellery since makeup I knew I had plenty ;) The maangtika is from my wedding. The nath is Maharashtrian nath and I added my own nath's string to it to match the look. I obviously don't have the piercing to wear a septum ring or mookuthi as they call it in south India, so I wore a clip on ear cuff to do justice with the look. 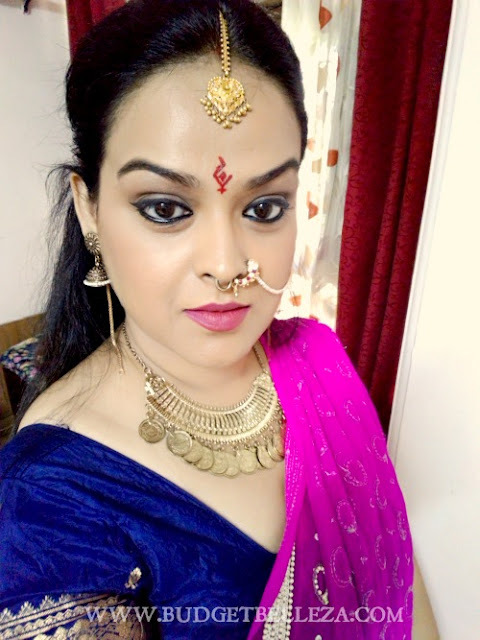 The jhumkaas and neckpiece are from my old ethnic jewellery collection. 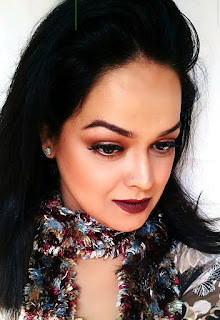 I landed on a liquid lipstick which was way too dark..I mixed some red lipstick (L'oreal Decked in Red) and painted the bindi with a triple 0 paint brush! Hahaha..thanks for your lovely support..love you! Madhuuu..I've seen ur work..all that halloween and other stuff..and coming from a creative genius like u..it means A LOT..
OMG this is goals!!!! u got such talent babe!!! Would u like to be a guest writer on my blog? Love your recreation of the look. great work.like to share some ideas with you.may i know your email plz?